There are so many questions. But, first in foremost, we have to ask: Who is this for? Who, when planning to spend a hot summer weekend at an outdoor festival, hopes to see Passion Pit, Malcolm Gladwell, and A-Rod all on the same lineup? What is the Venn diagram of Grover Norquist fans and Common fans? Why is Jemele Hill listed twice? Seriously, did no one proofread this thing? When the poster first started making the rounds on Twitter, people understandably believed it to be some sort of prank. How better to lampoon the desperate flailing of the American left than with a “musical festival” featuring Hillary Clinton, Salman Rushdie, and the guy who hosts HQ Trivia? But people soon realized OZY Fest was all too real. GQ published an article recently providing some context for the festival, which was started a couple years ago by the incredibly well-funded online magazine, OZY Media. Pitching itself as “news for the insatiable,” OZY Media hopes to engage that ever-elusive millennial demographic with their progressive, but not too progressive editorial takes. OZY Fest appears to be the physical embodiment of that ethos. 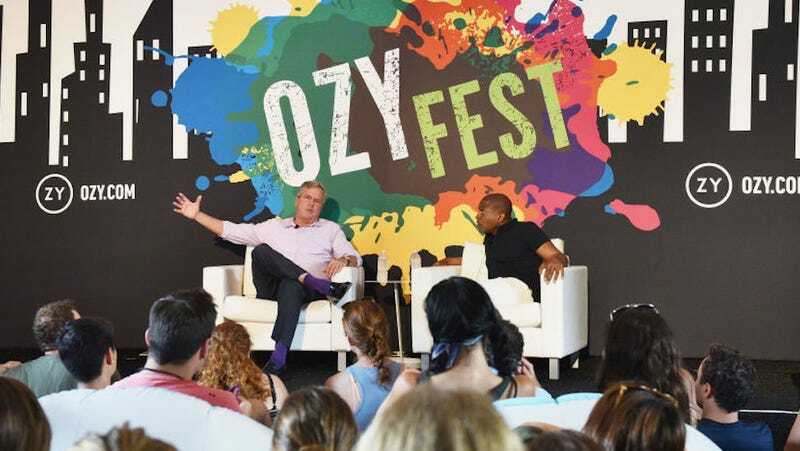 Whereas other politically minded festivals attempt to focus on one particular thesis statement or goal, OZY Fest seems to be a celebration of the very idea of politics, the very idea of music in a park, or the very idea of what some human beings would consider entertainment. But, hey, maybe it sounds like your cup of tea. In which case, we would recommend you drop your bean a half hour before Tom Perez hits the stage so you’re really peaking when he starts asking for DNC donations.